To the casual observer, today’s strong economy and booming manufacturing sector might give the impression that landing new customers in the industrial space is easy. As an industrial supplier, you know better. Marketing and sales tactics that proved so successful in days past have become obsolete virtually overnight. Today’s industrial buyer has more information at their fingertips than ever before. Long gone are the days when a buyer picks up the phone to contact your sales team at the start of the buying process. Today’s wealth of online information, and the desire for relative anonymity among millennial (and younger) buyers have them guiding themselves through as much as 70 percent of the buying process before they initiate contact with a supplier. This reality makes it vital that you understand how to connect with and support all buyers at each stage of the buying process — especially during that first 70 percent. If you’re like many of your peers in the industrial space, you simply don’t have the time to become the expert on all the latest marketing and sales approaches. You understand that leveraging online activity data is important to achieving your marketing and sales goals, but the raw numbers of simple web analytics seem like just that — numbers. Make the move to Opportunity Intelligence to support your buyers and power your business growth. Think about it. You don’t want to analyze things, you want to sell things. Opportunity Intelligence lets you go beyond simple web analytics, and start engaging real buyers. Long sales cycles that can range from months to a year or longer. 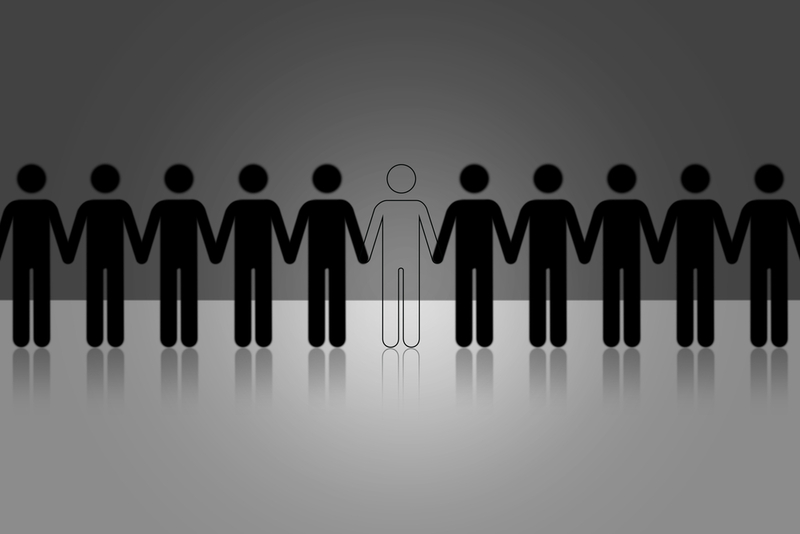 A finite market of customers to sell to. Sophisticated, technical buyers with very specific wants and needs. Buyers that have more control over their marketing and sales experience than ever before. Opportunity Intelligence unites your marketing and sales teams, helping them seamlessly support buyers that are in-market for your products and services, and guide those buyers down the buying process toward the sale. It helps them align their efforts as your business makes the critical shift from sales enablement to buyer enablement. Enabling today’s buyer calls for understanding today’s buyer. Successful suppliers are realizing that focusing on sales enablement ignores the reality that today’s industrial buyer conducts the buying process differently than in the past. Today’s buyers don’t want or need to be “sold,” they’re interested in information that helps them do their job, from early in the buying process up to and through the purchase decision. By no means does this shift from sales enablement to buyer enablement minimize the importance of your sales team; it actually increases its value to your prospects, and in turn, to your business. When your sales team understands exactly what type of information and level of support buyers want and need at each stage of the buying process, they can customize and focus their outreach to resonate with those buyers at every stage of the process. To that end, Thomas recently partnered with leading research firm Strategyn to conduct one of the largest ever studies into the needs of today’s industrial buyer. We surveyed and interviewed 315 industrial buyers over 45 weeks to determine their specific challenges, wants, needs and concerns as they navigate today’s increasingly complex industrial buying process. As these are just three of the 139 tasks buyers told us they need to consider, it’s clear that the industrial buying process is far more complex than one might expect. The result is that today’s buyer seeks out the specific information and support that aligns with the unique task they’re trying to accomplish at that moment within their greater buying journey. They don’t want a sales pitch. They want you to help them do their job. Opportunity Intelligence helps you “sell” the way today’s buyer buys. When you’re able to see how a buyer is engaging with your online content from their first ‘anonymous’ touch up through real-time, you’re able to align your marketing and sales efforts with the way that buyer wants and needs to be supported. Opportunity Intelligence lets you do so. Whether your opportunities are marketing qualified leads (MQLs) early in the buying process, or sales qualified leads (SQLs) closer to the purchase decision, Opportunity Intelligence gives you insight into where they are in the buying process, and what they’re actively interested in. This actionable insight means that you can better target your marketing efforts to support buyers (and generate opportunity) throughout the entire buying process, while evolving your sales team from cold-callers and order-takers to valued buyer-enablers for your prospects. Uncover your Opportunity Intelligence with Thomas WebTrax™ 3.0 — for free. Thomas WebTrax 3.0 lets you track, identify and engage buyers at all stages of their buying process — even before they’ve contacted you. 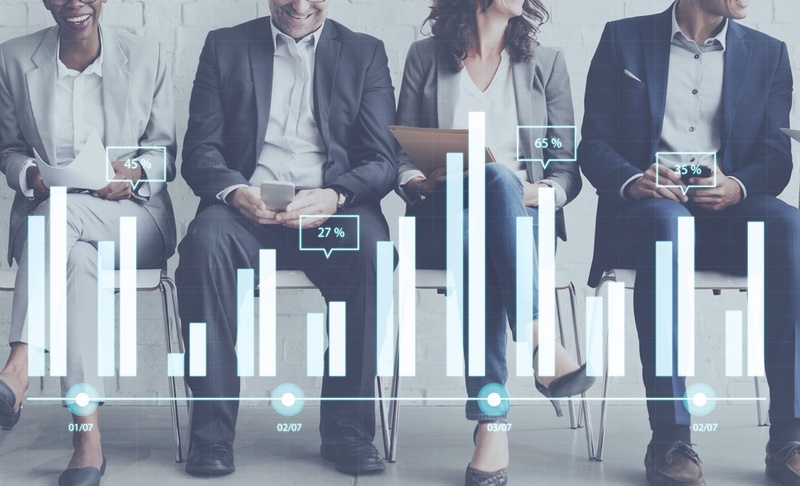 The Opportunity Intelligence it provides is actionable data on buyers that are actively in-market for the products or services you offer, making it possible for your marketing and sales teams to connect with and enable those buyers effectively — no matter how far along they are in the buying process. Whether buyers are visiting your industrial website or your Thomasnet.com presence, viewing your eCatalogs, downloading your CAD/BIM files, or even calling you by phone, Thomas WebTrax captures and stores detailed data on their activity, and presents it to you on one intuitive dashboard. Rather than provide simple “how many” analytics on the virtually meaningless metrics of traffic, clicks and visits, Thomas WebTrax helps you focus on who is interacting with your online presence, what they’re interested in, and how far along they are in their buying process. And because engaging real buyers is important, The Thomas WebTrax platform strips out the worthless bot activity that so often inflates the numbers you see in simple web analytics. Thomas WebTrax offers advanced filtering features that enable you to prioritize the highest value opportunities for your marketing team to nurture, and your sales team to pursue. You can specify criteria such as industry, location, company size, and revenue range, then easily isolate and view the activity of buyers that meet those exact specifications. You can also specify the highest value pages from among all of your online content. All filters and settings are easily adjustable, so you can ensure that the high-value opportunities you identify are always aligned with your evolving sales priorities and business goals. Once you’ve identified your high-value opportunities, the Opportunity Intelligence delivered by Thomas WebTrax enables your marketing and sales teams to engage and enable those in-market buyers like never before. By understanding where the buyer is along their buying journey, and by having insight into what they’re interested in, your marketing tactics and sales outreach calls can align precisely with what the buyer wants and needs at every stage throughout that journey. With the ability to feed your Thomasnet.com RFIs directly into your marketing automation system, Thomas WebTrax is an ideal solution for keeping your pipeline full and your sales team motivated. How to generate and use Opportunity Intelligence. Based on our in-depth research and our 120-year focus on serving the industrial buyer, Thomas can recommend how to communicate with, enable and engage buyers from the earliest stage of the buying cycle, through to the purchase decision. As you act upon your Opportunity Intelligence, the key thing to remember is to enable the buyer. Depending upon which stage of the buying process they are in, the information and support they’re looking for varies significantly. When you enable and engage buyers effectively at each stage of the buying process, you guide and advance them through that process while standing out from your competition. Enable and engage buyers in the Need stage. In this nascent stage of the industrial buying process, buyers passively yet consciously try to stay aware of the products and services that are available to meet the evolving needs of their business. Targeting buyers with the appropriate marketing tools in this stage can often create a need that the buyer previously hadn’t considered, while also generating actionable Opportunity Intelligence for your marketing and sales teams. Effective marketing tactics in this stage of the buying process include brand-building vehicles such as Video Campaigns, Display Advertising, Advertorials/Sponsored Content, and Newsletters — many of which can drive to downloadable content for which the buyer will readily provide their email address. This is early and actionable Opportunity Intelligence for you. Engaging buyers effectively at this stage can be done through an email nurturing campaign that promotes content that’s typical to the next stage (Research) of the buying cycle, such as your eBooks and White Papers. Enable and engage buyers in the Research stage. Once buyers have established that they have a need, they begin to actively research and educate themselves on the solutions that are available in the market. These buyers are hungry for information. Marketing tactics that enable them at this stage — while generating Opportunity Intelligence for you — include drivers to your website such as SEO programs and Pay-Per-Click campaigns. 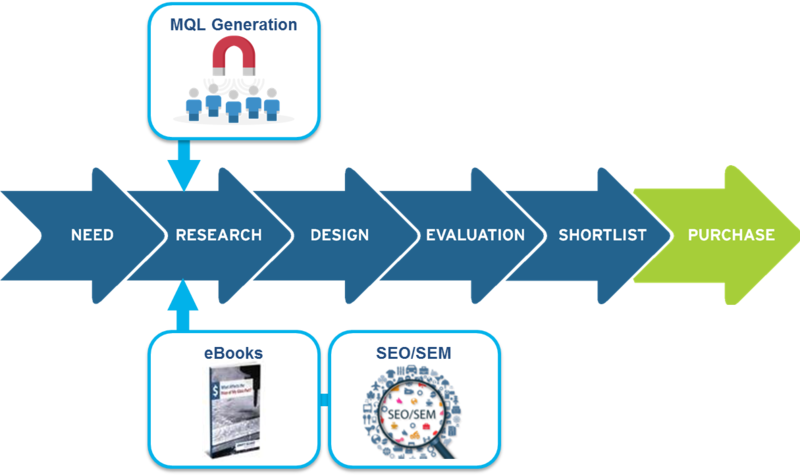 You can also implement email and Pay-Per-Lead campaigns leveraging your eBooks and White Papers. Effective enablement at any stage of the buying process drives the buyer forward to the next stage in that process. 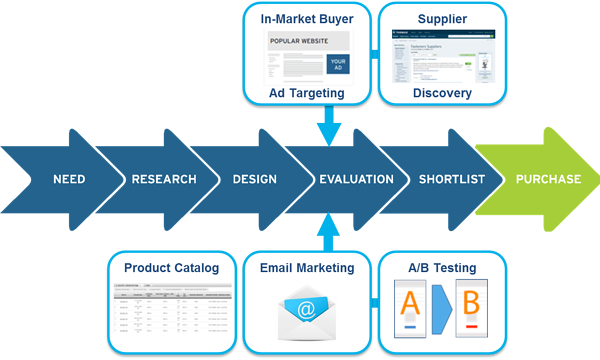 So, enabling buyers here in the Research stage is done through marketing that delivers content they might seek in the subsequent Design and Evaluation stages of the buying process. Email nurturing campaigns are effective here, delivering content such as CAD/BIM files, Product Data, and information on your company’s Services and Capabilities. 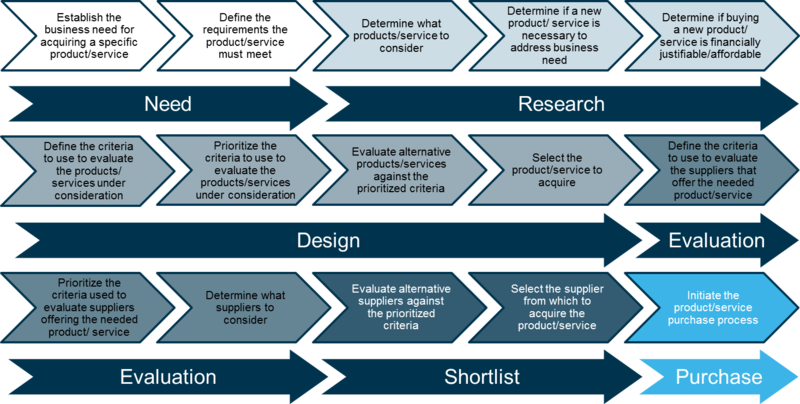 Enable and engage buyers in the Design stage. Buyers in the Design stage of the buying process are typically design engineers that are designing a prototype or high-volume component/assembly/product for an active project. They are looking for product data that will help them spec the right form/fit/function solution into their design. 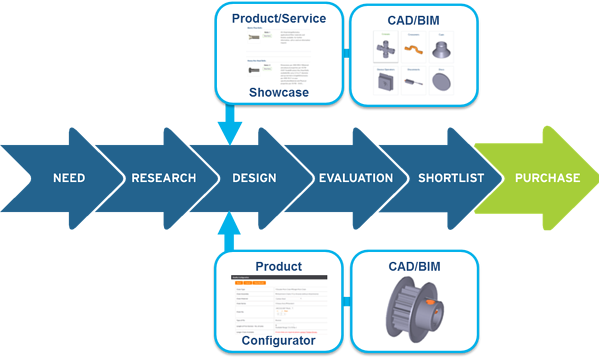 In the Design stage, marketing tactics that enable buyers — and generate Opportunity Intelligence — include downloadable or interactive content such as CAD/BIM models, Product Data, Technical Data Sheets, Configuration Tools, and Calculators. If you’re an OEM or distributor, our data shows that CAD/BIM models are the highest value lead conversion asset out of all your marketing and product content. If you’re a service provider, case studies and overviews of the different types of projects you’ve worked on are valuable in this stage. 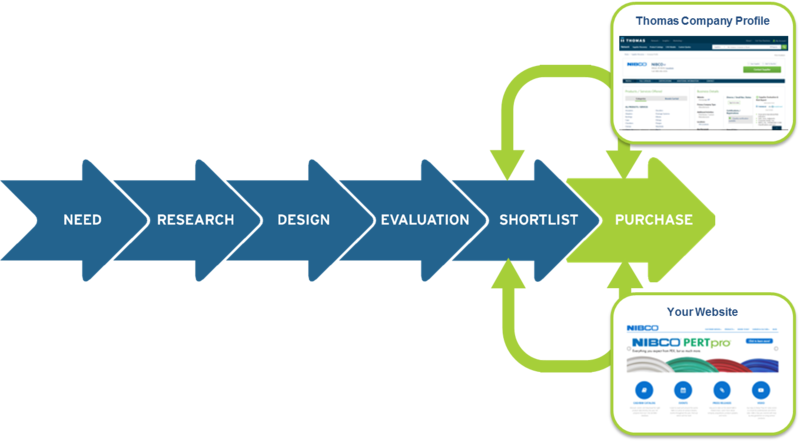 Engaging buyers in the Design stage calls for connecting them with content from the subsequent Evaluation and Shortlist stages of the buying process. In-Market Buyer Retargeting and Email Nurturing campaigns that drive to specific pages on your website or to your content on Thomasnet.com are helpful here. Enable and engage buyers in the Evaluation stage. Buyers in the Evaluation stage of the buying process are actively comparing the products or services available to meet their need, and/or comparing the suppliers that can provide them. In this stage they’re looking for information that assists them in narrowing the choices down to a shortlist of the best possible solutions. This stage may be the first time in the entire buying process that the buyer actively reaches out to you (or your competitors) with a phone call or RFI. Marketing tactics such as Email Nurturing , A/B Testing of Website Pages and In-Market Buyer Retargeting can generate Opportunity Intelligence on in-market buyers that are in the Evaluation stage. Relevant information at this stage includes such things as product comparisons across brands, replacement part number data for competitors’ products, and detailed company info such as that available in your Thomasnet.com Company Profile. Engaging and helping to advance buyers in the Evaluation stage calls for providing content they’ll need in the subsequent Shortlist stage of the buying process. Relevant information here includes things such as your product case studies, service success stories, supplier performance data and history, and certifications. The ideal goal of your marketing efforts at this stage is to have the buyer schedule a consultation with sales. Enable and engage buyers in the Shortlist stage. Buyers that have reached the Shortlist stage of the buying process have contacted the suppliers on that list, typically with an RFP or RFQ. At this stage, buyers are looking for information that will reassure them that the supplier they ultimately choose will be the right decision. Choosing the wrong product or supplier can be disastrous not only for the buyer’s company, but for the buyer’s career, so there’s typically a lot on the line when making the final decision on selecting a supplier for a large purchase. Marketing tactics to generate Opportunity Intelligence that identifies buyers in the Shortlist stage of the buying process would include vehicles such as your website or Thomasnet.com Company Profile, or other tactics where the buyer engages with content such as product case studies, service success stories, certifications documentation, your company locations information, and your supplier performance data and history. Effectively engaging buyers in the Shortlist stage calls for providing content that helps differentiate your company from the competition, and drives the buyer toward choosing you as their supplier. This can be information including RFP/RFQ support, certification documentation, financial/credit information, and business ownership/diversity designation documentation. Enable and engage buyers that have made the Purchase. Effective buyer enablement doesn’t end at the sale. You want long-term customers that do business with you again and again. You also want those customers to share positive stories about their experience with you to other prospects, ideally through referrals. Enabling and engaging your customers after the sale can take many forms beyond any ongoing service and support that may be part of your contract. There are many marketing tactics that can be both effective and welcome. Provide news on your company, perhaps through your newsletter. Share industry news and info that might be relevant to your customer. Provide information that educates your customer on new products and services, or makes them aware of new certifications your company has earned. Celebrate and congratulate your customers’ news and achievements on your company’s social media channels. Your sales team is also key to engaging your customers after the sale. They can foster trust and build long-term relationships by doing such things as calling to review product and delivery performance metrics, or inquiring about new projects your business might be able to support. At a minimum, your sales representative should try to have quarterly discussions with the customer, ideally face to face. Get the Opportunity Intelligence that only Thomas WebTrax can deliver. If you’re ready to go beyond simple web analytics and start engaging real buyers, put Opportunity Intelligence to work for your business. Thomas WebTrax bridges the gap between marketing and sales, giving them actionable data on in-market buyers throughout the entire buying process. It helps your company make the critical shift from sales enablement to buyer enablement, and “sell” the way today’s buyer buys. Thomas WebTrax is free to qualifying companies; visit Thomasnet.com/WebTrax to get your team started today.